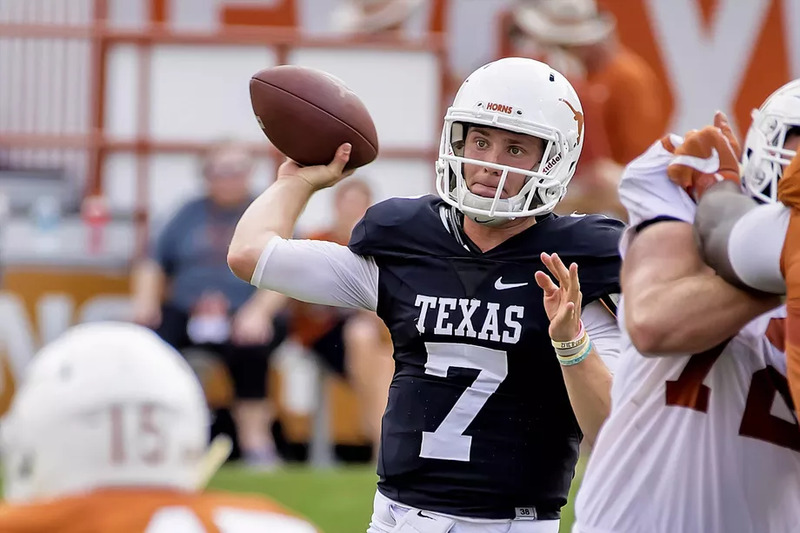 On a misty spring night at Darrell K. Royal Texas Memorial Stadium, the 2018 variant of the Orange-White Spring Game confirmed much of what we already know regarding the current state of the University of Texas football program. Namely, that the team is in need of a quarterback to step up and take control. On defense, things appear to be as fearsome and fast as expected. And on special teams, the program appears to have a collection of legs that, though not quite ready for prime time, has all the makings of a special group in players in the future. The White squad beat the Orange team 23-13 in front of a crowd of approximately 20,000 orange-clad Texas diehards here for their first glimpse at the 2018 iteration of the University of Texas Longhorns football team. The White team put the first true points on the scoreboard with a 29-yard field goal from senior Joshua Rowland. It would take the entirety of the rest of the first quarter, but the Orange team finally fired back on an 11-yard touchdown pass from Shane Buechele to Collin Johnson. Chris Nagger added the PAT. Johnson, the junior from San Jose, appears to be the gem of the receiving corps. He finished the game with 6 receptions for 91 yards and a touchdown. But #84 Lil'Jordan Humphrey showed hints of a breakout season coming down the road, particularly on a 24-yard catch from Ehlinger that set up Humphrey for a 1-yard rushing touchdown to put the White squad ahead 13-7 after a Rowland extra point. Humphrey finished the game with seven catches for 100 yards in the first half. Jerrod Heard caught four passes for 89 yards to bolster the receiving department for the Orange squad. Buechele immediately returned fire for the Orange team, dropping a gorgeous 38-yard pass directly into the arms of Jerrod Heard. At the end of the second quarter, Rowland drilled a picture-perfect 50-yard field goal to give the White squad a 16-7 lead at the half. Buechele went 12-18 for 130 yards and a touchdown in the first half. Ehlinger was 13-22 or 151 yards. Neither quarterback threw an interception in the half. Buechele remained in the QB position for the Orange team to kick off the second half. His first play from scrimmage was a long throw to John Burt that sailed five yards over Burt's head. Cameron Rising replaced Ehlinger at QB for the White team to begin their first drive of the second half. Rising was unsuccessful in marching the team down the field. Buechele was replaced on the second drive by Casey Thompson. With 1:47 left in the third quarter, Rising connected with WR Jordan Pouncey on a gorgeous 32-yard linkup to put the White team within shooting distance. Rising then connected with WR Davion Curtis for 14 yards and the third quarter ended with the White team on the Orange 3. Humphrey ran the ball into the end zone for his second rushing touchdown, and Rowland kicked the PAT to make the score 23-7 White. Thompson led the Orange team up the field in quick manner, throwing two long passes to get his side within striking distance of the end zone. He couldn't get the ball into the end zone, ultimately turning the ball over on a 4th and 9 on a pass into the corner of the end zone. With just over two minutes remaining in the fourth quarter, Tim Yoder punched in a short-burst run through the defensive line to put the final score on the board. Rising and Thompson performed admirably in their second-half appearances. Rising's final tally was 6-9 for 57 yards; Thompson went 5-9 for 88 yards. - Early enrollee P Ryan Bucjevski, the cousin of former Longhorn punter Michael Dickson (UT's first-ever winner of the Ray Guy Award in 2017), showed fits of promise in his work during Saturday's game. His first punt of the game was a booming 59 yarder, but his follow-up of 38 yards likely shows a more realistic portrait of where Bucjevksi is right now. He'll settle into the role as he grows and it's likely Texas has another special leg waiting to blossom. - DB B.J. Foster showed bits of incredible athleticism in breaking up plays in the first half.